Another coppicing session this morning, starting where we left off, just north of the Budge screen. Joined by Steve, the three of us made good progress until my chainsaw made strange noises, noises that sounded expensive...if not fatal! So that was us, no chainsaw and not really fancying tackling some of the bigger trees with a bow saw, what else to do but go birding? Whilst we were coppicing skylarks, wrens, robins and dunnocks were all singing. In the dunes, it was heartening to see pair of stonechats back on territory, I feared this species might have succumb to two successive cold winters. 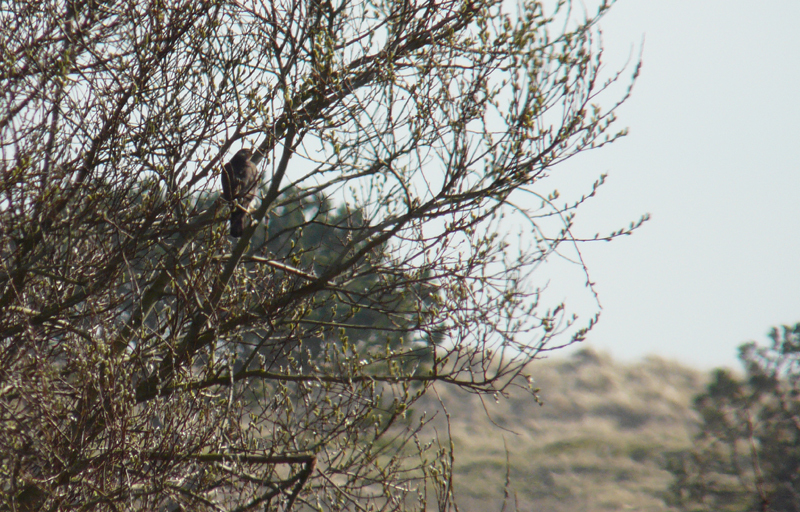 Amazingly, the dunes now seemed full of meadow pipits. 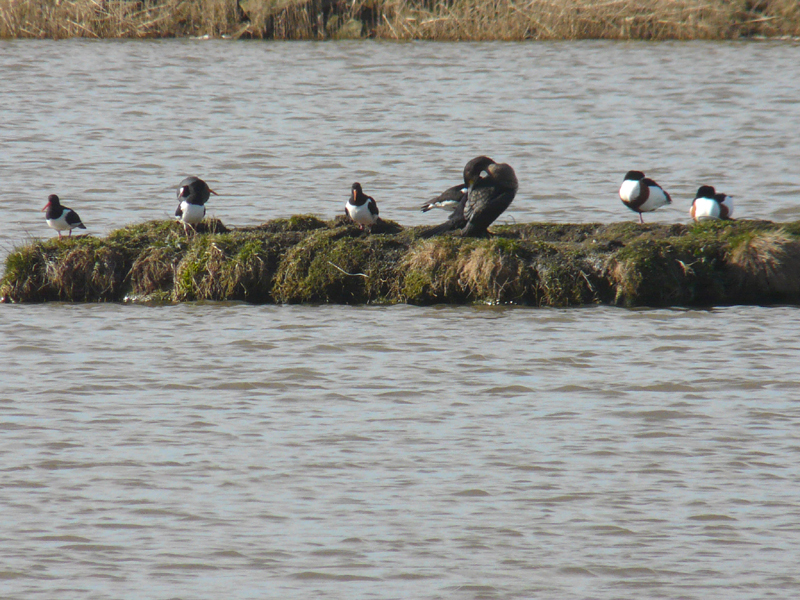 No 'true' migrants yet, I had my hopes pinned on an osprey - may as well aim high! The only other highlight was big female sparrowhawk hunting over the Budge fields and along the edge of the shelterbelt. It flew straight at us in the Budge Screen. Now, if I had two grands worth of dSLR kit, I would've had frame filling flight shots. As I haven't, here it is, miles away, perched in a tree. Douglas' Island was attracting some attention from a number of species today, I've lost track of the Douglas' Island list. Finally, a word of advice. 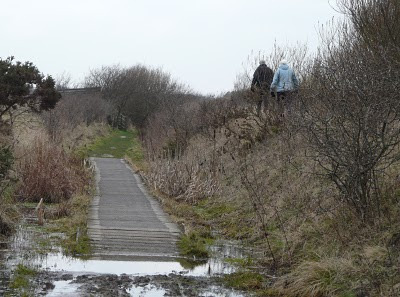 If you're heading for Druridge Pools and intend going to the Oddie or little hides, do bring your wellies. This poor couple hadn't, but were obviously keen to see what was on the pool, as they scaled the bund and teetered along the edge to get there. Nature-based tourism at its finest! 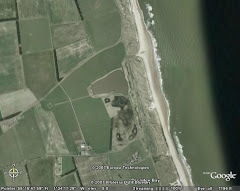 Would Norfolk Wildlife Trust would get away with this Cley? Looks like you could use some of that coppice wood to extend the boardwalk. That couple should leave their notebook with their wellies cos there'll be nowt on the pond after that!